Earlier this month, leaders from the New York Senate and the Assembly joined fast food workers outside a McDonald’s restaurant in midtown Manhattan to demand that the $8 minimum wage being paid to workers in the state be raised. New York State recently raised its minimum wage from $7.25 at the end of 2013. It will go up to $9 at the end of 2015. But fast food workers say it’s not enough. “It’s really hard to survive in one of the most expensive cities in the world on my current wage,” said Abdoul Hadi Guiro, 22, who works at a Harlem restaurant. Guiro says he struggles to support his family in New York City and 12 siblings in Burkina Faso on his current wage. Workers carried banners demanding that the minimum wage be increased to $15 per hour. “I don’t want to call it the minimum wage. I want to call it a living wage. 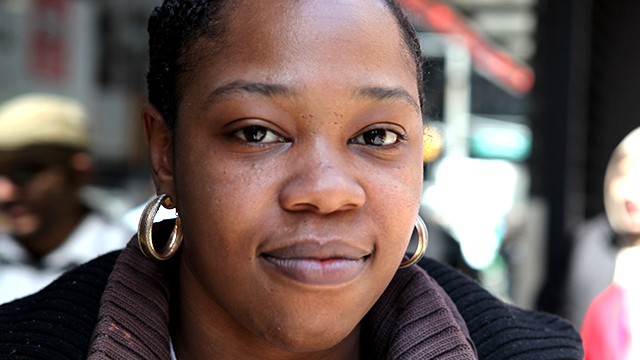 I want something to live off of,” said Shantel Walker, a manager at a fast food restaurant, at the Apr. 3, 2014, protest. Expressing their solidarity with protestors – some of whom were dressed as mascots of McDonald’s, Burger King and Wendy’s – were Senators Andrea Stewart-Cousins (D-Westchester County), James Sanders Jr. (D-Jamaica) and Assembly members Gabriela Rosa, Karim Camara, Linda Rosenthal and Victor Pichardo, among others. If passed, the bill would give New York City and other municipalities in the state the right to set its own minimum wage. “It’s like taking care of each one of our homes. Nobody knows your household but you,” said Assembly member Gabriela Rosa.